Diabetic retinopathy is a major public health problem. Diabetic retinopathy treatment and screening consumes increasing resources year-on-year in most developed countries. This is because diabetic retinopathy is a potentially blinding condition, and is currently the fifth commonest cause of blindness in the world. One million Americans have advanced diabetic retinopathy, which if untreated, may lead to permanent blindness. Every year, up to 25,000 adult Americans become blind from diabetic retinopathy. Diabetic retinopathy is caused by diabetes mellitus. Blindness from diabetic retinopathy occurs due to diabetic maculopathy and proliferative diabetic retinopathy. Currently the most important treatment for sight-threatening diabetic retinopathy is retinal laser, such as pan-retinal photocoagulation (PRP). However, of equal importance is good control of diabetes and blood pressure to prevent advanced retinopathy from developing in the first place, and regular eye screening to detect signs of progression early. The earlier treatment is given, the better the outcomes. Sometimes in special situations, additional retinopathy treatment with intravitreal injections and vitreoretinal surgery are required despite extensive retinal laser. 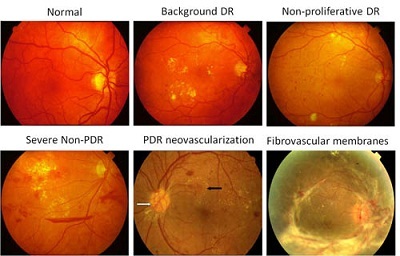 The various stages of severity of diabetic retinopathy, ranging from normal (top left) to end stage disease with severe scarring (bottom right). Intravitreal injections are injections of either steroid or anti-Vascular Endothelial Growth Factor (anti-VEGF) medications into the vitreous cavity of the eyeball. This is becoming an increasingly popular treatment option for diabetic macular edema and proliferative diabetic retinopathy. In fact, intravitreal injections are now frequently being used in combination with retinal laser to enhance the retinopathy treatment effect. Steroid such as triamcinolone and anti-VEGF drugs such as bevacizumab, ranibizumab and aflibercept work in two ways. Firstly, they interfere with chemicals that encourage leakiness of the retinal blood vessels. This helps to stop further leakage of fluid and protein from the blood vessels at the macula. This reduces the amount of fluid in the macula (diabetic macular edema), restores the structural integrity of the macula, and therefore maintains your central vision. 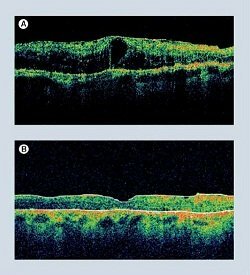 The picture on the left shows successful treatment for diabetic macular edema. Top (A): Macular swelling and thickening before treatment. 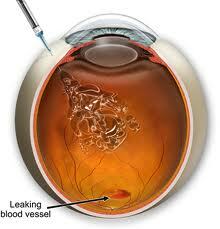 Leakage from the retinal blood vessels causes fluid to accumulate in the macula. This disrupts the function of the macula and causes reduced vision. Bottom (B): The fluid in the macula has now cleared. Notice how the macula has returned to its original thickness and architecture. Secondly, the anti-VEGF drugs also interfere with chemicals (produced by retinal cells damaged from the diabetes) that stimulate the growth of abnormal new blood vessels. By doing so, abnormal new blood vessels will stop growing and may even regress or disappear completely. The use of anti-VEGF in proliferative diabetic retinopathy treatment is becoming more widespread and more accepted. It is particularly useful in cases where vitreous hemorrhage has occurred. In these cases, the view of the retina may be too hazy and obscure for effective retinopathy treatment with laser to be performed. Before the injection, you will be given dilating drops to enlarge your pupil, anesthetic eye drops to numb your eye and antibiotic drops to reduce the risk of infection. A clip will be used to keep your eyelids open. The injection itself takes no more than 5 minutes and shouldn't be painful although you may feel a slight sting or scratch. Your eye may feel slightly sore after the anesthetic effect wears off. Complications of intravitreal injections are uncommon and occur in less than 1% of the time. If a complication happens to you, treatments are usually available to fix any problems that arise from it. The main complications of this form of retinopathy treatment are raised eye pressure (potentially leading to glaucoma), cataract, retinal detachment and severe infection of the eyeball (infective endophthalmitis). 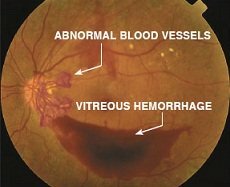 Vitreous hemorrhage occurs when abnormal new blood vessels bleed into the gel in the vitreous cavity. The blood blocks light that enters the eye from reaching the retina. The amount of sight loss can be mild to severe, and depends on how much blood is in the eye. Your vision will slowly improve as the hemorrhage gradually clears over several months. A vitrectomy will be needed to restore your vision if the blood does not clear up by itself. The aim of surgery is to remove the blood and scar tissue that has developed within the eye due to the abnormal new blood vessels. Success of surgical proliferative retinopathy treatment depends on whether all sources of the bleeding can be dealt with at the time of surgery. Success is also dependent on having all the scar tissue removed completely. Often, pan-retinal photocoagulation laser treatment is also performed during surgery. 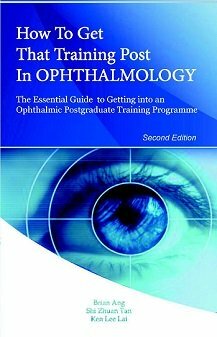 This is because the the view of the extreme retinal periphery is much better when looking through the operating microscope. This procedure involves removing the vitreous gel from the vitreous cavity and replacing the gel with a clear solution. As much blood and scar tissue within the eye is removed as possible. This is done with special instruments, such as the vitrector (or vitreous cutter) and light pipe. Depending on the circumstances, gas or silicon oil may be inserted into your eye. If so, you may need to follow some stringent positioning instructions after surgery, similar to that after retinal detachment surgery. 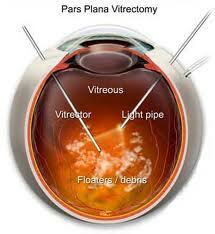 Vitrectomy is usually performed as a day case. It can be performed either under local anesthesia (where you are awake) or under general anesthesia (where you are put to sleep). If you opt for local anesthesia, you will need an anesthetic injection (either subtenon or peribulbar) around the eye to numb it. Prior to that, you will be given dilating drops to enlarge your pupil and anesthetic eye drops to provide an initial numbing effect to your eye. The operation itself can take from 30 minutes to 3 hours, depending on the complexity of the surgery. If gas is inserted into your eye, you should not travel by air for at least 2 months when the gas would have dissipated away. If silicon oil is inserted into your eye, you will not have any travel restrictions. However, you will need to have a second operation to remove the silicon oil. You should be able to go home after a short rest following surgery. Do not drive. Make sure there is someone with you for 24 hours after surgery. Your eye will feel uncomfortable, sore and itchy. It will also be sensitive to light and feel as though there is something in the eye. You will be given eye drops (antibiotic to prevent infection and steroid to reduce inflammation) to put in your eye after surgery. Be careful not to accidentally hit or press against the eye. It is best not to swim or engage in strenuous activities while you are still using the eye drops. It is alright to read or watch television. Note: When you develop a vitreous hemorrhage, you vision can drop dramatically. It can seem frustrating that your ophthalmologist is only advising you to wait a few months for the blood to reabsorb. And in the meantime, there is nothing you can do apart from waiting and maintaining good sugar and blood pressure control. It is best not to rush into surgery, especially if the bleeding does clear by itself. Your ophthalmologist will want to perform vitrectomy at the time that is most likely to give you the best outcomes.